At Microsoft’s event later today, the company is expected to its new Surface Pro 6 alongside a Surface Laptop 2, and an updated Surface Studio. 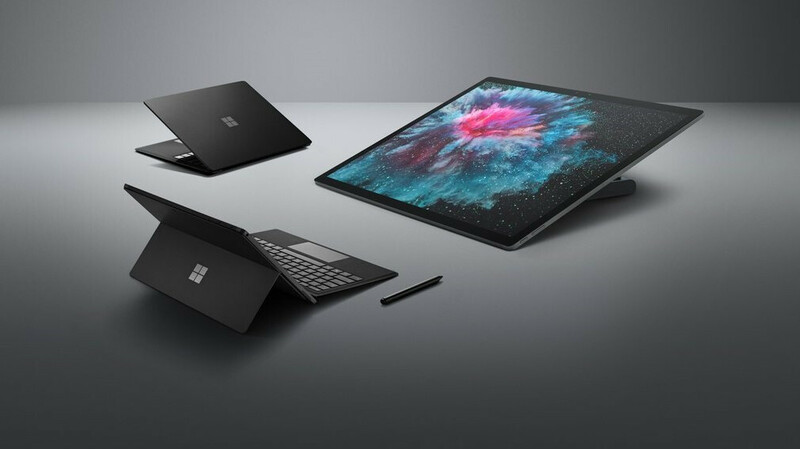 And with just over 1 hour to go until the event kicks off, a marketing image depicting the black Surface Pro 6 alongside the other devices has leaked out. Overall, the image itself doesn’t necessarily reveal anything major – the Surface Pro 6 leaked out entirely a few days ago – but it does back up previous suggestions of an iterative upgrade. As revealed last week, the tablet will once again make use of a large 12.3-inch display complete with a resolution of 2736 x 1824. This will come coupled with a few choices. The cheapest variant of the tablet will come with a seventh-generation Intel Core M chip alongside 4GB of RAM. However, those looking for something more powerful can opt for 8GB of RAM with the choice of Intel’s Core i5 or Core i7 eight-generation processors. Another thing worth noting is that all variants come equipped with 128GB of internal storage. On the software side of things, the Surface Pro 6 is expected to ship with Windows 10 complete with S-Mode enabled. However, Microsoft will offer users the choice of upgrading to the complete Windows 10 Home experience for free. Unfortunately, though, there will be no option to upgrade to the Pro software. The Surface Pro 6 is expected to go official later today at Microsoft’s event. Following this, the company will likely launch a pre-order period relatively soon after. 6th Gen and still only 128GB of storage. Should be 256GB now. Great product overall though. I will just keep using my SP4 until it doea a hire le death. Even though it has been a great device overall, it has had issues and a replacement once and yet still has issues. Too bad there is nothing to look forward too. Just the same old design with improved hardware. But you can configure it right, so you choose your own storage size. I'm not really interested, but it'll be better than whatever Apple has. No upgrade to windows 10 pro? Not buying then! No more pc base computers for me.